EDUSAINS is a journal publishing the Natural Science Education, Biology Education, Physics Education, and Chemistry Education Journal. Edusains is published by Center for Science Education (CSE) which is located in Departement of Natural Science Education, Faculty of Education and Teachers' Training, Islamic State University (UIN) Syarif Hidayatullah Jakarta. Editors welcome scholars, researchers and practitioners of education around the world to submit scholarly articles to be published through this journal. All articles will be reviewed by experts before accepted for publication. Each author is solely responsible for the content of published articles. EDUSAINS has become a CrossRef Member since year 2015. Therefore, all articles published by EDUSAINS will have unique DOI number. Scope: This journal receives articles about research and current issues related with natural science education, biology education, chemistry education, and physics education scope. Indexed & Abstracted: Yes (DOAJ; GoogelScholar; Moraref; PortalGaruda; Sinta; and more..
Publikasi tidak dikenakan biaya kecuali bagi beberapa artikel pilihan yang diterjemahkan ke dalam bahasa Inggris akan dikenakan biaya terjemahan dan proofread. Panduan penulisan jurnal dan Tempelate jurnal silahkan unduh DI SINI. 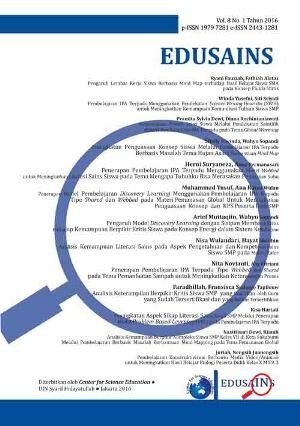 Daftar pustaka ditulis menggunakan mendeley, tata penggunaan mendeley unduh DI SINI.